Pet saffa is purely ayurvedic enriched with 11 herbs and effective in giving relief from gastrointestinal problems. The herbs of Pet Saffa are kind to the walls of the stomach and cannot cause any complications. Fruit contain a high level of insoluble fiber and can help to add bulk to the waste material and in their easy pass out. Vegetables are also a hub of both soluble and insoluble fibers and can help in relieving constipation. Legumes like beans, peas, and pulses are high in fiber and this makes them a right choice for getting relief from constipation. Try to eat whole grain bread, oatmeal, barley that can help to solve the trouble of constipation. Besides taking fiber-rich foods, you can also take the help of ayurvedic medicine for constipation. 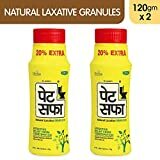 In case of severe constipation problem, you can take Pet Saffa Powder for Constipation. If you liked reading this article – “Fibrous Foods That Help In Relief From Constipation”, do like it and share with others. You can share your views with us in the comment box below.